Halloween elite team THE JACKIE FACTORY (Jackie 60, Night of 1000 Stevies) return for their sixth annual GHOSTLIGHT, a Halloween theatrical and costume party benefiting the HOWL EMERGENCY LIFE PROJECT (HOWL HELP), the East Village wing of THE ACTORS FUND. 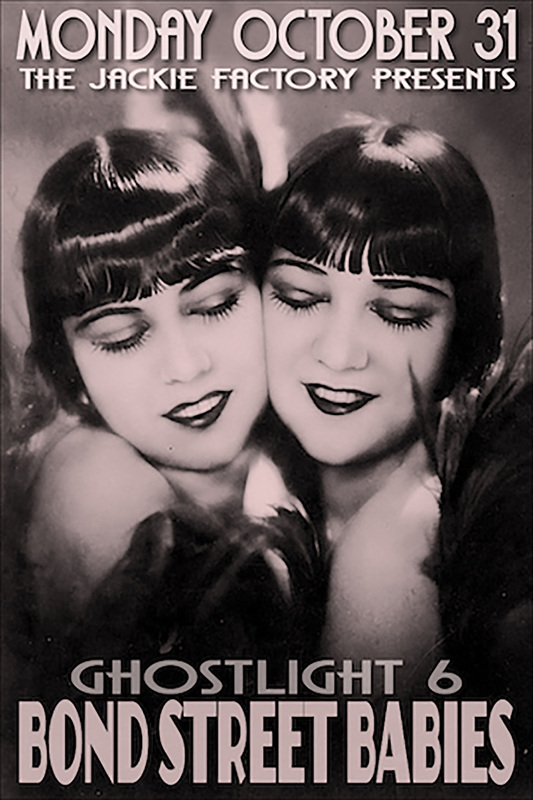 The theme of this year's GHOSTLIGHT is BOND STREET BABIES, with its haunted flappers, the 1920's Village and its speakeasies - our host theater was one! Feel free to interpret it with ghostly 20s finery or come in your theatrical costumed best or black tie. Set in the venerable and haunted GENE FRANKEL THEATRE on Bond Street, the evening's theatre-as-nightclub will again host Downtown performance icons and rising stars from many dynasties. The 2016 bill includes Jackie Factory/ Boylesque Dark Star POISON EVE, GHOSTLIGHT favorite SEVERELY MAME, Method Burlesque icon THE MAINE ATTRACTION, thesbian goddess HEATHER LITTEER, 20s vintage burlesque stars BEE L ZEBABE (NYC) and MAID MURRAY (NOLA), the costume genius of ART BY DAVEY and many more (bill still in formation.) Ghostlight's "Secret Cinema" will feature a full screening of East Village/ BLACKLIPS Horror classic JACK THE RIPPER by FLLOYD at 9:30 PM plus 20s silent films after midnight..
On a night that can be TRULY scary outside, it is a glam sanctuary here: A marvelously mixed and dressed audience, reasonably priced drinks, AND a great cause! GHOSTLIGHT producer CHI CHI VALENTI joins the golden-throated MC PAUL ALEXANDER as the Mistress/Masters of Ceremonies and the divine DJs are JOHNNY "JOLSEN" DYNELL, SAMMY JO and ALTHEA LOVELESS. Performances are in two sets at 10:30 and and 12:30 - please consult mothernyc.com/ghostlight for complete schedule as we get closer. An annual fundraiser begun in 2011, GHOSTLIGHT celebrates East Village theatrical traditions and nightclub ghosts of the past 150 years. The show's current venue (since 2013) was the longtime home of East Village theater pioneer, director and acting teacher GENE FRANKEL and is an ideal setting. Frankel (who died in 2005) definitely haunts the premises, as well as various other apparitions from the Theatre's storied past. Winner of the first OBIE for direction in 1959, Gene Frankel's landmark 1961 production of JEAN GENET's play "THE BLACKS" launched the careers of JAMES EARL JONES, CICELY TYSON, LOUIS GOSSETT JR and MAYA ANGELOU, among others. The 24 BOND STREET building is formerly a hat factory, speakeasy, and avant-garde jazz club and also housed the first studio of photographer ROBERT MAPPLETHORPE. Its GENE FRANKEL THEATRE is home to the brand-new 24 BOND ARTS CENTER, a nonprofit community theater and performance group, along with its resident companies. ​HOWL HELP was created to provide emergency financial assistance and social service support to artists who have participated in the annual HOWL FESTIVAL or who make their careers in New York City's East Village and Lower East Side arts community. Administered by THE ACTORS FUND, HOWL HELP serves the needs of many artists whose work (of any generation) challenges the traditional boundaries of dance, theatre, music, multimedia and the spoken word.HOWL HELP is one of the core programs of HOWL ARTS INC., which include HOWL! HAPPENING, the exciting new East Village gallery.